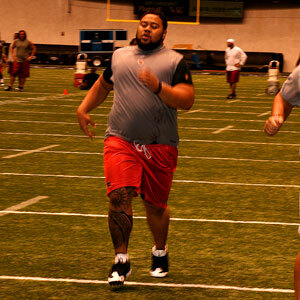 The Cardinals just had their conditioning test and everyone passed, including G Deuce Lutui (whom Mike Jurecki reported yesterday weighed about 360 right now). Lutui actually looked pretty good running and beat out a teammate or two, although some of the veterans clearly know their pace and how fast (or slow) they can run to still make the make-able time. Everyone had to run two sets of 300-yard shuttles, save for the 10-year NFL vets like Bryan Robinson, Adrian Wilson and Anthony Becht. Coach Ken Whisenhunt isn’t speaking until after practice this afternoon. Lutui wasn’t available yet either, although I am trying to track him down. We’ll see if the rain comes back, forcing the first practice inside this afternoon. Or if the massive amount of rain already these two days will make it too slippery to be outside. This could be a very wet camp. On a side note, congrats on a longer-than-expected career for former Cardinal Pro Bowl special teamer Sean Morey, who decided to announce his retirement today when he was supposed to start camp with the Seattle Seahawks. Morey was a good man who squeezed every bit of ability out of his body and gave everything to the Cards. He has become an advocate for the concussion issue in the NFL, although he fought the should-I-play-or-not issue himself. He’s an Ivy Leaguer so he will do fine post-football, but I am guessing he was hoping his NFL life would have lasted a bit longer. The Cardinals brought back middle linebacker Monty Beisel on a one-year contract Monday, something necessary to uphold a semblance of depth at the position. Four guys also signed their tender offers: wide receiver Steve Breaston, center Lyle Sendlein, defensive tackle Gabe Watson (all restricted free agents) and cornerback Michael Adams (who was an exclusive free agent). The Cards now have just one unsigned restricted free agent — guard Deuce Lutui. Again, the Cards also lost a free agent Monday when wide receiver Sean Morey signed with the Seahawks, a move that wasn’t surprising. With the owners’ meetings wrapping up today and the pace of free agency slowing down, it may be a good time to look at where the Cardinals’ roster stands — and where there are holes that need to be filled by the time minicamp begins April 30. This topic crossed my mind after writing yesterday about the signing of wide receiver Darren Mougey, who may or may not pan out but certainly isn’t been seen (at least as of now) as a replacement, whether it’d be Anquan Boldin or even Jerheme Urban. He’s just one of many receivers that will be on the roster this summer. Today, the Cardinals officially have 60 61 players on the roster, leaving 19 spots to be filled by the draft/undrafted rookies (which figures to total between 14 to 16, depending) and then some free-agent spots. There are seven veterans un-signed who could still return: LB Monty Beisel, FB Dan Kreider, QB Brian St. Pierre, S Matt Ware, K Neil Rackers, DT Bryan Robinson and WR Sean Morey (although I think Morey is more likely to end up in Seattle right now). What spots need shoring up? The Cards need at least one more quarterback, and even if St. Pierre comes back, they need someone young, at least for camp. They need another receiver or two, although I am guessing whether they chase a veteran may depend on what happens in the draft. Remember, at that spot, a fourth receiver would likely need to play special teams and guys like Kevin Curtis or Torry Holt tend not to want to do such things. The Cards definitely need to look at nose tackle, especially if Robinson doesn’t return. They need inside linebackers even if Beisel comes back (which I expect). They probably could use another young pass rusher at outside linebacker without knowing exactly what Cody Brown/Mark Washington/Stevie Baggs brings to the table. I wouldn’t be surprised to see them get another cornerback — you can never have too many — and a return man is also needed if Steve Breaston is going to be the No. 2 wideout. General manager Rod Graves is in Orlando right now for the owner’s meetings. I’m not sure exactly what happens with the Cards now in free agency — I am trying to get that answer — I wouldn’t be surprised if the plan, at least until the draft, is to chase a few of the Cards’ own un-signed guys like Bryan Robinson and then wait until after the draft to see where else the roster needs talent. One spot the Cards will keep considering outside in free agency is kicker. 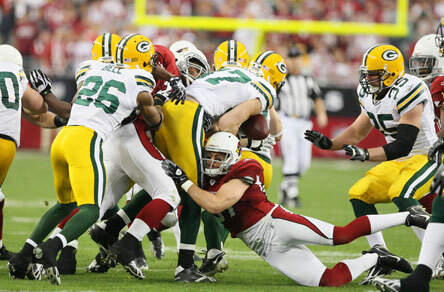 Jay Feely is still in play — he finished up his visit Monday — and there remains the option of bringing back Neil Rackers. Safety Matt Ware, despite earlier reports elsewhere in the NFLverse, has not yet re-signed and I don’t get the sense that’s imminent. I still think he eventually returns. Wide receiver/special teamer Sean Morey wants to return, I believe, but he has yet to re-sign and took a visit with the Seahawks. UPDATE: Well, I was partially on track. I heard back from Graves, who said the Cards will continue to consider free agents. But if the Cards sign players from elsewhere, they would “likely be to replace some of our own UFAs that we do not have agreements with.” That’s the category Feely would fall under, and would come into play, it would seem, if guys like Robinson, Morey, Ware, linebacker Monty Beisel, quarterback Brian St. Pierre or fullback Dan Kreider don’t return. I think the free agency market will be very interesting post-draft. Veterans who are waiting now for bigger potential deals probably aren’t going to get them, and historically it’s even harder to get a decent deal after the draft because teams have filled up their holes with new talent that can be home-grown. What happens to Mike Gandy or Chike Okeafor, for instance (other than that they won’t be in Arizona)? And will anything change this week, after NFL owners are going to get the low-down of exactly where things stand with the impending labor problems? Anquan Boldin’s farewell appearance at the Cardinals’ facility was today (going on now, in fact) at Kurt Warner’s annual charity flag football tournament. 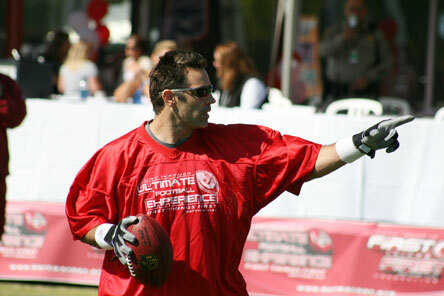 There is a bit of irony in the fact that, after Friday’s trade, there are actually more active Ravens playing in the tourney (Boldin, tight end Todd Heap and quarterback Joe Flacco, pictured below) than Cardinals (Larry Fitzgerald and Sean Morey, although the recently retired Warner and quarterbacks coach Chris Miller are also out there). Boldin talked for a while about leaving Arizona. He said it was “bittersweet.” He said he had mixed emotions. And he said change was good. I suppose, sometimes, change is necessary. 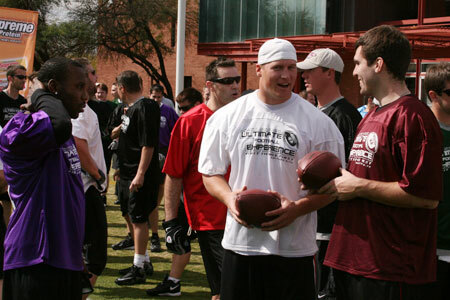 I mean, back to the Cards’ Tempe facility to play his annual charity flag football tournament. … No, not back with the Cardinals after choosing to reverse his retirement decision. I apologize if the headline was misconstrued. Anyway, it is time for Warner’s annual tourney, which will be held Saturday on the Cards’ practice fields. He’s got a star-studded list (although it’s not always a lock every guy actually makes it): Besides Warner, the “QBs” for the tournament are Aaron Rodgers, Matt Ryan, Joe Flacco, Philip Rivers, Todd Heap, Michael Strahan, Marshall Faulk and then the Cardinals’ contingent — former Falcons QB and current Cards’ quarterback coach Chris Miller, Larry Fitzgerald, Anquan Boldin and Sean Morey. Before you ask, sorry, the event isn’t open to the public. The teams/corporations involved pay Warner’s First Things First foundation big bucks for exclusivity. And I’d expect Warner’s team to be in the title game once again. Warner always wants to win anyway, and now, this is his lone football outlet. Ranking special-teams units across the league is not an easy task, so when Rick Gosselin of the Dallas Morning News came up with a system to do so, it’s become universally regarded as the best way to sort out such things. And this season, Gosselin’s rankings put the Cards eighth. “Our specialists had a good year,” Spencer said, noting improvements in punts inside the 20, net and gross punting averages, and field-goal-made percentage. “The return game showed some life. Rookie LaRod Stephens-Howling made an impact both in coverage and as a kickoff return man, while Sean Morey was a Pro Bowl alternate this season on special teams. Punter Ben Graham was snubbed for the Pro Bowl himself after tying the NFL record for punts inside the 20. Neil Rackers made an NFL-best 94.7 percent of his field-goal attempts. The Cards also got impactful seasons from guys like Jason Wright and Kenny Iwebema, among others. “It’s amazing how smart you become when you have good players,” Spencer said.